Our Sun Ray Brackets' gracefully curved bottom edges create wonderful arches. Use inside for dramatic arched openings or on porches to make a bold statement. We sell Sets and Individual Brackets in two sizes below. Our standard 3-piece Sun Ray Bracket Sets come in two sizes and fit either 62" or 46" wide openings when Brackets are installed horizontally, as shown in the top left photo above. 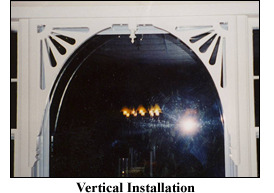 However, the "foot" is a separate piece, so you can install Brackets vertically to fit narrower 46" or 33-1/2" openings (or if you merely prefer a taller arch), as shown in the top right photo above. Both Sets are orderable below. Wider openings can be accommodated using Extender and a second Drop. Photo to the left shows a 3-piece Set installed vertically with 1 extra Drop and optional Extender between the Drops. Extender continues the line of the top frame across the entire space and Drops provide a nice transition between the Extender and frame ends. Order Extender and extra Drop to create a custom length Set. Includes two 1-1/4" thick x 30" x 26" (including 1-3/4" deep frames) Sun Ray #1 Bracket/30, two Feet, and one 2" x 2" Square Drop. This larger Set fits 62" wide openings when Brackets are installed horizontally, as shown here and in top left photo above, and 46" wide openings when Brackets are installed vertically, as shown in the top right photo above. Includes two 1" thick x 22-1/4" x 19" (including 1-1/2" deep frames) Sun Ray #1 Bracket/22, two Feet, and one 1-1/2" x 1-1/2" Square Drop. This smaller Set fits 46" wide openings when Brackets are installed horizontally, as shown here and in the top left photo above, and 33-1/2" wide openings when Brackets are installed vertically, as shown in the top right photo above. 1-1/4" thick x 30" x 26" (including 1-3/4" deep frames) and when the included Foot piece is installed on shorter side, as shown to the left. 1" thick x 22-1/4" x 19" (including 1-1/2" deep frames) and when Foot piece is installed on shorter side, as shown to the left. When Foot is installed on the longer side, as shown to the right, Bracket measures 16" x 25-1/4". 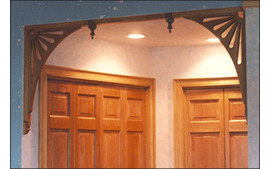 Order one extra Foot below for each Bracket installed without Drops or Extender. 1-3/4" x 1-1/2" x 4" size fits 30'' Bracket and larger 62'' Set. 1-1/2" x 1-1/2" x 3" size fits 22-1/4'' Bracket and smaller 46'' Set. Order one extra Drop for each Set installed with Extender. Drop with turned Finial (far left) - Finial is light-colored, smooth hardwood, regardless which Material is specified below. 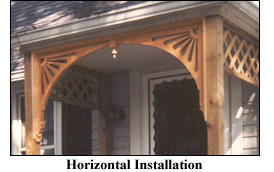 PVC Drop for PVC Sun Ray Bracket (near left) - Finial is also PVC. 2" x 2" Drop fits 30" Bracket and larger 62" Set. 1-1/2" x 1-1/2" Drop fits 22-1/4" Bracket and smaller 46" Set. Sold by the foot in 1' to 9' lengths. 1-1/2" x 1-3/4" size fits 30'' Bracket and larger 62'' Set. 1-1/2" x 1-1/2" size fits 22-1/4'' Bracket and smaller 46'' Set. Material: Select One--------------Poplar Cypress PVC Pine Oak, Red Oak, White Cedar Redwood --------------I'll contact you about another wood.Contact me about another wood.